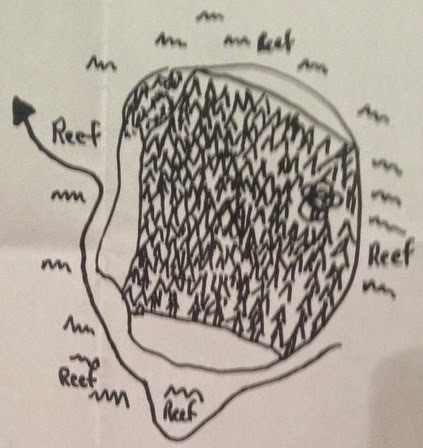 A map of an uncharted island? What?! For his Dirty Roger Campaign, tom created a couple of maps. This was a fragment we found in the late Captain Philip Saxus' quarters. It depicted a safe course to follow around an Island in the mysterious and uncharted Opus Circle. The real question was how did the captain get this map piece? This little sketch was a visual cue Tom wrote for himself. We were to follow the "X's". 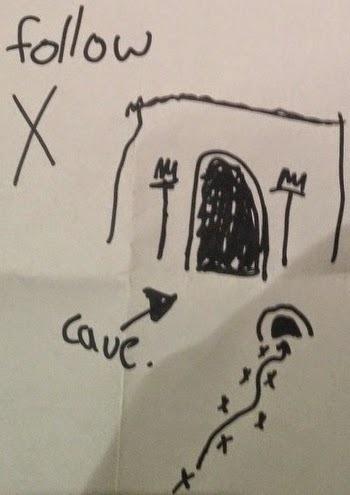 There were 7 "X's" that lead to a cave, which had a torch either side of the entrance. A neat little piece of Dungeon Mastering.